Ahh! The best for the last. Foot anatomy! The 'inside' story. Really 'INSIDE'! Don't worry. This is a SIMPLE overview, not a medical or technical dissertation. We leave that to the experts. Here you can get a much better appreciation of your feet. It will help you understand why we spend all the time we do on the 'foot thing'. We've already talked about the various Foot Pain issues and proper Foot Care. 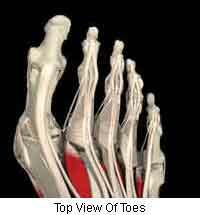 And about the importance of Shoe Fit and how it relates to your specific foot 'construction' or make up. OK. That's as technical or detailed as we are going to get here. 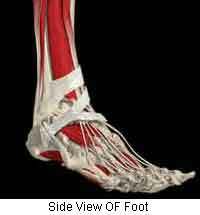 It's time you took a quick look 'inside' that old foot of yours. And we do mean 'inside'. 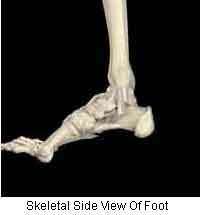 These computer generated images let you see only some parts of the foot anatomy. This helps make it easier for you to see. 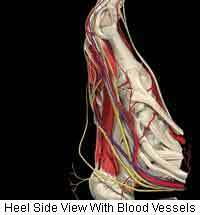 All have the bones, some have ligaments and tendons, some have blood vessels. (These 3D Computer Graphic images of the human foot are used with the kind permission of Primal Pictures of London, England. (opens new window). Since 1991 they have pursued their goal of generating a complete and medically accurate computer model of the complete human anatomy). Wow! Isn't it incredible what all is in there? It's even more incredible that they work at all, let alone put up with all the abuse we give them. Want to more than just this quick overview? 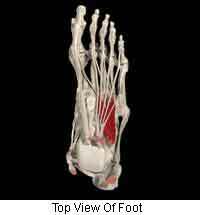 You're welcome to download a free copy of A Patient's Guide to Foot Anatomy an excellent article compliments of the great folks at Orthopod in Missoula, Montana. Here's a great little pocket book by James Watkins called Pocket Podiatry: Functional Anatomy, 1e with lots of great reference information and much more. Did this little peek 'inside' help? We hope so. 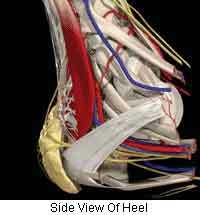 And we hope you have a much better appreciation of just how complex your old foot really is. And how important it is for you to look after them, pamper them, treat them well, use the right shoes and socks. Just darn well be nice to them. They deserve it! Now you're ready to really look after those old feet, get out and Start Walking and Feel Great Again!.